This is my favorite cookie from my childhood. I remember my Mom used to make them every year, just around the time school let out for the summer. Now, I've decided to continue the tradition for my son Max, and bake up a batch of these deliciously soft cookies that are flavored with coconut, pineapple and macadamia nuts then frosted with an awesome ginger pinapple icing! Spread coconut in a shallow baking dish and toast in oven preheated to 350F degrees, about 4 to 6 minutes. Stir occasionally to prevent burning. In a large mixing bowl, cream 1 cup sugar, brown sugar, and 1 cup butter until dough is light and fluffy. In a medium mixing bowl, stir together flour, baking powder, baking soda, 1/2 teaspoon salt and allspice. Gradually stir dry flour mixture into moist dough mixture until thoroughly combined. Stir in toasted coconut, macadamia nuts and pineapple. Drop dough by heaping teaspoonfuls onto prepared sheets, spacing at least 2 inches apart. Bake at 350F degrees for 8 to 10 minutes or until lightly golden brown. Remove cookies from pans and place on wire racks to cool completely. Meanwhile, prepare the frosting. In a clean large bowl, combine confectioners' sugar, ginger, 1/2 cup butter and reserved juice until smooth, fluffy and spreading consistency. Spread icing generously over cooled cookies. 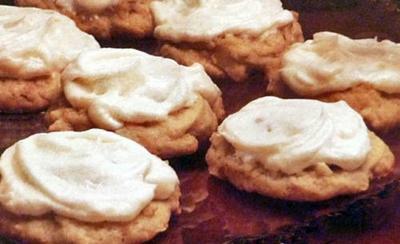 This recipe makes about 6 1/2 dozen Frosted Aloha Cookies.